SmallCapVoice, The Street, and London Irvine Report reported on New Jersey Mining Company (NJMC), and today we are highlighting the Company, here at the QualityStocks Daily Newsletter. New Jersey Mining Company has built, and is the majority-owner and operator, of a fully-permitted, upgraded, 360-ton per day flotation mill and cyanide leach plant. Additionally, the Company is 100-percent owner of the Golden Chest Mine project. This is an historic lode gold producer, which has been expanded, modernized, and operated by a first-class lessee. New Jersey Mining provides custom milling services for small-scale mining operations. New Jersey Mining is headquartered in Coeur d'Alene, Idaho. The Company’s Mill office is in Kellogg, Idaho. New Jersey Mining can offer, for larger companies, an assortment of mining and exploration services, including custom milling. It is pursuing near-term production of its own, with a longer-term vision toward district-scale deposit potential. The Company is ramping up the flotation mill to handle incoming ore shipments from the nearby Golden Chest Mine. The flotation mill recycles process water. It utilizes a paste tailings disposal process patented by Company founder Mr. Fred Brackebusch to reduce impact on the environment. The New Jersey Mill can perform test and toll milling on material from mines and prospects within a wide radius of active mining camps in Montana, Idaho, and Washington. In 2016, New Jersey Mining completed its acquisition of GF&H. This is a private company that holds 374 acres of patented mining claims near New Jersey Mining’s Golden Chest Mine Project. The GF&H land package includes claims just south of the mine property and on-strike with the Idaho Fault. Furthermore, in 2016, the Company announced that it completed its purchase of a 50-percent interest in Butte Highlands Joint Venture LLC, owner of the fully-permitted, high-grade, underground Butte Highlands Gold Project south of Butte, Montana. New Jersey Mining’s interest in Butte Highlands is “carried to production” by the joint venture (JV) partner, Montana State Gold Company, LLC (MSGC). New Jersey Mining announced in November 2017 that underground operations commenced at its Golden Chest Mine near Murray, Idaho. The Company is currently operating from two locations at the Golden Chest Project – the open pit mine it developed and operated in 2017 and the underground mine that was largely developed in 2015 and readied for production in 2017. All ore is being shipped for processing to the Company’s nearby New Jersey Mill. Recently, New Jersey Mining Company announced that it expanded its land holdings contiguous to its presently producing Golden Chest Mine in the Murray Gold Belt area of Northern Idaho. It added the “Buckskin Claim Group” consisting of 218 acres of patented mining claims acquired via an exploration and mining lease, and roughly 700 acres of unpatented mining claims acquired via Company staking. The newly acquired Buckskin Claim Group is next to existing Golden Chest unpatented claims. The new acquisition effectively extends New Jersey Mining’s Golden Chest property package an additional 2.5 kilometers (1.5 miles) to the west. Last month, New Jersey Mining announced results from its recent exploration trenching program at its Golden Chest Mine. It completed 14 trenches, totaling 653 meters, designed to test for near-surface, open-pittable gold mineralization in areas where the Idaho Fault and its associated vein set project to the surface. Trenches were completed in three target areas. This is the area just north of the presently producing Golden Chest pit, and within the Klondike Ridge and Katie-Dora ore shoots. Earlier in March, the Company announced that it added to its land holdings in North Idaho’s Murray Gold Belt (MGB) with the lease of the Four Square Property. The Four Square Property consists of 334 acres of mining claims, including 46 acres of patented mining claims, situated near the town of Murray, three miles west of the Company’s Golden Chest Mine. In addition, New Jersey Mining acquired, by staking, 348 additional acres of unpatented mining claims south of the leased area, adjacent to the patented claims. New Jersey Mining Company (NJMC), closed Thursday's trading session at $0.151, down 10.65%, on 196,300 volume with 6 trades. The average volume for the last 60 days is 50,633 and the stock's 52-week low/high is $0.10/$0.185. TradingView and MarketWatch reported on FISION Corp. (FSSN), and today we are highlighting the Company, here at the QualityStocks Daily Newsletter. FISION Corp. is a cloud-based digital asset management and marketing automation company based in Minneapolis, Minnesota. It serves enterprise clients in the health care, hospitality, financial/insurance, software, and technology industries. FISION has more than 65,000 users in 21 countries. FISION is an effective sales enablement and marketing asset management tool. Established in 2011, FISION lists on the OTCQB. The Company’s solutions include simplified brand distribution, sales enablement, distributed & localized marketing, digital asset management, channel support, and measurement & analytics. FISION equips marketing and sales teams with a comprehensive set of enablement capabilities built to solve distributed marketing challenges. FISION maximizes the brand potential of every sales interaction. Its advanced, proprietary technology specializes in managing customers’ brand and marketing content. This enables marketing and sales people to quickly and easily create compelling, personalized, on-brand communications that drive revenue and profits. The Company’s centralized, cloud-based library supports close to 200 different file types. It gives a client total control over how company assets are stored, retrieved, and used. FISION completed the acquisition of Volerro Corporation (Minneapolis, Minnesota-headquartered) following the announcement of a definitive purchase agreement on April 25, 2017. Volerro is a leader in cloud-based content collaboration and agile marketing technology. Volerro enhances the FISION platform with complementary cloud-based collaboration, agile marketing, and sales enablement software. Volerro’s SaaS platform simplifies how enterprise teams create, refine, and distribute content. Volerro’s ReVu.Me cloud app allows team members to work on the same document in real-time with integrated chat and voice conferencing. FISION’s patented platform’s unique multi-tiered and multi-tenant functionality permits outside agencies and other marketing partners to securely access a company’s content repository, as well as create collateral materials that stay true to approved branding and messaging. Last month, FISION announced that it deployed its cloud-based digital asset management and agile marketing solution for a Fortune 500 financial services company. This company has over 20,000 employees and advisors across the nation managing greater than $700 billion in assets. In addition, FISION provided an innovative integration with the client’s new event planning platform. This delivers an even deeper level of capabilities and benefits with its patented digital asset management technology. This month, FISION announced that it deployed its cloud-based digital asset management and sales enablement platform for Medici, a fast-growing software company that is transforming the way doctors and patients interact. Medici enables users to text or video chat with their existing medical providers, including primary care physicians, pediatricians, specialists, therapists, veterinarians, dentists and more, via a HIPAA-compliant app. FISION Corp. (FSSN), closed Thursday's trading session at $0.1735, up 2.06%, on 5,900 volume with 4 trades. The average volume for the last 60 days is 50,376 and the stock's 52-week low/high is $0.0811/$0.86. FeedBlitz, HyperSpeedStocks, The Next Hot Stock, Volcano Stocks, OtcWizard, and Nebula Stocks reported on 3PEA International, Inc. (TPNL), and we also report on the Company, here at the QualityStocks Daily Newsletter. 3PEA International, Inc. is a vertically integrated provider of innovative prepaid card programs and processing services. These are for corporate, consumer, as well as government applications. Via its PaySign® brand, the Company designs and develops payment solutions, prepaid card programs, and customized payment services. OTCQB-listed, 3PEA International is headquartered in Henderson, Nevada. Fundamentally, the Company is a payment processor and debit card program manager. It manages programs for many of the world’s largest pharmaceutical manufacturers with copay assistance products designed to maximize new patient acquisition, retention, and adherence. 3PEA International’s customizable prepaid solutions provide considerable cost savings. This is while improving brand recognition and customer loyalty. The Company’s customers include healthcare companies, major pharmaceutical companies, and source plasma providers. Additionally, its customers include large multinationals, prestigious universities, and social media companies. 3PEA International has launched the PaySign® brand of prepaid cards. This includes solutions for corporate incentives, payroll, public sector, pharmaceutical co-pay assistance, and source plasma donations, general spend reloadable and other market niches. Through the PaySign platform, 3PEA International provides an array of services. This includes transaction processing, cardholder enrolment, value loading, cardholder account management, reporting, and customer service. 3PEA has expanded its PaySign® brand of prepaid cards to the automotive market with PaySign Connect for Automobile Dealerships. The comprehensive PaySign Connect prepaid solution is a customizable, multi-purpose platform tailored to the unique needs of auto dealerships. 3PEA International has an increased presence in the plasma donation payments space through signing The Interstate Companies and B Positive National Blood Services. Furthermore, the Company entered into an agreement with Visa, whereby 3PEA exclusively issues Visa-branded prepaid cards for the PaySign® brand. This week, 3PEA International reported financial results for Q4 and full year ended December 31, 2017. Revenues for the year ended December 31, 2017 were $15,234,091. This represents an increase of $4,817,419 versus the year ended December 31, 2016, when Revenues were $10,416,672. Gross Profit in 2017 increased to $6.7 million or 44.0 percent of Total Revenues, versus $4.5 million, or 43.6 percent of Total Revenues in 2016. Net Income in 2017 was $1.8 million or $0.04 per diluted share, versus Net Income of $1.4 million, or $0.03 per share in 2016. As of December 31, 2017, 3PEA International had more than1,550,000 PaySign Cardholders participating in 205 card products. The Company continues to increase the number of card products in its portfolio. 3PEA International, Inc. (TPNL), closed Thursday's trading session at $1.17, up 2.63%, on 26,289 volume with 8 trades. The average volume for the last 60 days is 28,958 and the stock's 52-week low/high is $0.385/$1.1901. SeeThruEquityResearch, DSR News, Planet Penny Stocks, SecretStockPromo, StockOnion, BestDamnPennyStocks, Penny Picks, Buzz Stocks, Damn Good Penny Picks, Penny Pick Finders, Innovative Marketing, HEROSTOCKS, Stock Brain, SmallCapVoice, PennyStockProphet, Penny Stock Newsletter, PHUB News, Stock Commander, TheNextBigTrade, PREPUMP STOCKS, and OTC Markets Group reported on Endonovo Therapeutics, Inc. (ENDV), and we also highlight the Company, here at the QualityStocks Daily Newsletter. Endonovo Therapeutics, Inc. is a biotechnology company based in Woodland Hills, California. It is a leading developer of bioelectronic-applications in cell therapies and non-invasive electroceuticals. Endonovo’s initial concentration is on the treatment of acute and chronic inflammatory conditions of the liver employing its proprietary Immunotronics™ platform and the treatment of Graft-Versus-Host Disease using its ex vivo expanded and enhanced stem cells. Endonovo Therapeutics is centering its efforts on inflammatory conditions in vital organs. The Company’s Immunotronics™ platform is a non-invasive, non-implantable, bioelectronic device for treating/preventing vital organ failure through the reduction of inflammation, cell death, and the promotion of regeneration. Its Cytotronics™ platform provides for a method of expanding and manipulating cells utilizing simulated microgravity and Time-Varying Electromagnetic Fields (TVEMF) for tissue engineering and cell therapies. The basis for Endonovo’s TVEMF technology was created at NASA in combination with the development of cell therapies to treat injuries and diseases that astronauts might encounter during long term manned missions in space. The purpose of the Company’s Cytotronics™ platform is to create optimized cell-based therapies with more therapeutic potential than the un-modulated cells presently being used in regenerative medicine. Endonovo Therapeutics is in the pre-clinical phase of evaluating its proprietary Immunotronic technology in the treatment of chronic and acute inflammatory conditions in the liver. This includes fulminant liver failure. The Company is developing a next-generation, off-the-shelf treatment for Graft-Versus-Host Disease (GVHD) using Cytotronics™ expanded and ex vivo enhanced stem cells from the human umbilical cord. Endonovo is expanding its liver disease research program and its Cytotronics™ platform to create a high-fidelity drug development and toxicology testing platform. Endonovo Therapeutics is starting a pre-clinical study at a contract research organization to assess the therapeutic potential of its Immunotronics™ platform in the treatment of critical limb ischemia (CLI). This pre-clinical study will evaluate the effect of the Company’s non-invasive electroceutical technology on limb function, ischemia damage, as well as blood flow. This includes the formation of new blood vessels (angiogenesis). Moreover, Endonovo is starting a pre-clinical study at a contract research organization to assess the therapeutic potential of its Immunotronics™ platform in preventing and reversing inflammation in Non-Alcoholic Steatohepatitis (NASH). In addition, it is starting a pre-clinical study at a contract research organization to assess the therapeutic potential of its Immunotronics™ platform in preventing and reversing inflammation and fibrosis in kidney disease. Recently, Endonovo Therapeutics reported that it completed a study to evaluate the potential efficacy of its Immunotronics™ platform in a well-established preclinical model of heart failure (post-MI remodeling). With these positive results, Endonovo continues to advance the development of its pipeline of non-invasive electroceuticals targeting vascular diseases and inflammatory conditions in vital organs. The recently completed study investigated the therapeutic efficacy of the Immunotronics™ platform in an extensively used mouse model of heart failure (post-MI remodeling). In the model, treatment with Endonovo’s non-invasive electroceutical two or three times per day resulted in considerably increased cardiac function and reduced ventricular remodeling. Endonovo Therapeutics, Inc. (ENDV), closed Thursday's trading session at $0.034, up 6.25%, on 1,504,820 volume with 66 trades. The average volume for the last 60 days is 1,180,234 and the stock's 52-week low/high is $0.018/$0.136. Promotion Stock Secrets, AimHighProfits, and Insider Financial reported previously on Force Protection Video Equipment Corp. (FPVD), and today we are reporting on the Company, here at the QualityStocks Daily Newsletter. Force Protection Video Equipment Corp. sells high definition (HD) body camera systems and accessories for law enforcement. It offers its LE10 Law Enforcement Video Recorder product. The Company formerly went by the name Enhancer-Your-Reputation.Com, Inc. It changed its name to Force Protection Video Equipment Corp. in March 2015. The Company is based in Cary, North Carolina and lists on the OTC Markets’ OTCQB. Force Protection Video Equipment has incorporated a wholly-owned subsidiary, CobraXtreme HD Corp., a North Carolina Corporation. This subsidiary’s purpose is to sell HD videos sports cameras and accessories, which are similar to those sold by GoPro. In addition, it will sell video goggles and sunglass cameras. In addition, CobraXtremeHD carries a complete line of aftermarket accessories for extreme sports cameras such as GoPro® and Garmin®. The design of CobraXtremeHD cameras are for use in extreme sports. Regarding the LE10 Law Enforcement Video Recorder product, it is a small bodyworn HD camera. It is half the size and half the price of most law enforcement cameras presently on the market. The LE10 has numerous features, including still picture ability 8MP, WIFI, 4x zoom, and audio recording. The LE10 does not require special software or expensive storage contracts. The Company also has its LE50 HD Bodycam. The LE50 is a state-of-the-art designed body camera. It is strategically built around Ambarella chip sets (AMBA). Select important design features of the LE50 include industry leading record time (10 hours @1080,12 hours @720); 50 hours of standby time; 32GB of internal tamperproof storage; as well as white LED illumination. Force Protection also released the LE100 and LE101 1080 HD in car video recording dashcam systems. The LE100 and 101 are state-of-the-art designed in-car dash camera systems. They are strategically built around Ambarella A7 chip sets (AMBA). Moreover, Force Protection has its camera system for Law Enforcement and Security Agencies. The design of the C1, Citadel camera system is to combat and deter graffiti, illegal dumping, and other property crimes. This self-contained system is solar powered. The C1 Citadel requires no external power. All of the Company’s cameras and recording devices have FCC, IC and CE certification. Today, Force Protection Video Equipment announced the release of its 2018 Product Catalog. The 2018 Product Catalog is now available and has been circulated to more than 25,000 Police and Sheriff Departments. The catalog is considered a restricted item by the U.S. Justice Department. It is not available to the general public. The Force Protection Video Equipment website is password protected for restricted products. Force Protection Video Equipment Corp. (FPVD), closed Thursday's trading session at $0.0016, down 5.88%, on 17,564,107 volume with 51 trades. The average volume for the last 60 days is 5,828,296 and the stock's 52-week low/high is $0.0015/$0.825. Penny Stock Hub, Stockhouse, Stock Gumshoe, InvestorsHub, TradingView, Barchart, OTC Markets, 4-Traders, Uptick Newswire, Insider Financial, Investopedia, Streetwise Reports, and The Street reported on ProMIS Neurosciences, Inc. (ARFXF), and today we are highlighting the Company, here at the QualityStocks Daily Newsletter. A biotechnology company, ProMIS Neurosciences, Inc. concentrates on the discovery and development of precision treatments for neurodegenerative diseases, especially Alzheimer’s disease (AD) and amyotrophic lateral sclerosis (ALS). ProMIS is based around the leading science of Dr. Neil Cashman, Professor of Medicine at the University of British Columbia, Neuroscientist at the Brain Research Center, and Academic Director of the Vancouver Coastal Hospital ALS Center. Incorporated in 2004, ProMIS Neurosciences lists on the OTC Markets Group’s OTCQB. The Company previously went by the name Amorfix Life Sciences Ltd. It changed its name to ProMIS Neurosciences, Inc. in July of 2015. ProMIS has offices in Toronto, Ontario, and Cambridge, Massachusetts. The Company employs two proprietary computational discovery technologies, ProMIS™ and Collective Coordinates. It uses these to predict novel targets known as Disease Specific Epitopes (DSEs) on the molecular surface of misfolded proteins. ProMIS Neurosciences has a strong patent estate relating to misfolded SOD1 in ALS and multiple patents for disease specific epitopes (targets) and monoclonal antibodies (mAbs) selectively targeting toxic misfolded Amyloid beta oligomers (AβO) in AD. For Alzheimer’s disease, the Company’s most advanced priority program, three validated product candidates have been designated. These are PMN310, PMN350, and PMN330. During 2017, ProMIS Neurosciences successfully completed validation of five therapeutic candidates for AD. All of these demonstrated the desired target profile of binding to soluble brain tissue extracts from AD patients without binding to plaque. Moreover, in 2017, the Company filed a provisional patent application with the U. S. Patent and Trademark Office (USPTO) relating to a novel therapeutic target on misfolded forms of TDP43. ProMIS initiated development of antibodies selective for this target associated with toxic, aggregated forms of TDP43. ProMIS Neurosciences announced earlier this month that its lead product candidate for Alzheimer's disease (AD), PMN310, showed similar ability to cross the blood brain barrier and penetrate the central nervous system (CNS) compared to aducanumab (Biogen). ProMIS Neurosciences’ President and Chief Executive Officer, Dr. Elliot Goldstein, stated, "Our latest data lend further support to the potential best in class profile of PMN310. We previously reported greater selectivity and binding of humanized PMN310 for toxic, amyloid beta (Aβ) oligomers in direct comparison to other amyloid beta-directed antibodies, including aducanumab." Last week, ProMIS Neurosciences announced the appointment of Sharon Cohen, MD, to its Scientific Advisory Board (SAB). Dr. Cohen is the Medical Director and Principal Investigator of Toronto Memory Program, which is an independent medical facility for dementia care and research. Dr. Cohen is a globally respected important opinion leader in the field of dementia. Dr. Cohen is also a sought after consultant and advisor on many dementia programs. ProMIS Neurosciences, Inc. (ARFXF), closed Thursday's trading session at $0.3589, down 5.55%, on 285,877 volume with 124 trades. The average volume for the last 60 days is 638,380 and the stock's 52-week low/high is $0.1109/$0.70. Stockopedia, OTC Markets, Stockhouse, and InvestorsHub reported on Fortem Resources, Inc. (FTMR), and we report on the Company as well, here at the QualityStocks Daily Newsletter. Fortem Resources, Inc. is an oil and gas production, development, and exploration enterprise. It has a diversified natural resource portfolio of chiefly oil and gas assets and one gold asset. Fortem Resources has offices in Calgary, Alberta, and North Orem, Utah. Established in 2004, the Company formerly went by the name Strongbow Resources, Inc. It changed its corporate name to Fortem Resources, Inc. in March of 2017. The Company’s shares trade on the OTC Markets’ OTCQB. Fortem Resources’ properties are located in Western Canada, North America, and internationally via five wholly-owned subsidiaries. These subsidiaries are Rolling Rock Resources, Black Dragon Energy, Colony Energy, Big Lake Energy, and City of Gold. Fortem’s current operating and technical team has proven success in conventional and non-conventional oil and gas plays in North America and around the world. The Company’s business strategy is focused on developing quality energy projects with lower risk profiles and identified upside potential. On May 17, 2017, Fortem Resources acquired 100 percent of the membership interest in City of Gold, LLC, a Nevada limited liability company, from two Nevada limited liability companies -- MAB Resources Holdings LLC and JM Magna Holdings LLC, pursuant to a Membership Interest Purchase Agreement dated as of May 17, 2017. With this Option Agreement, Asia Pacific and Nyi Nyi Lwin agreed to grant to City of Gold the option to purchase 100 percent of the ownership interest in a wholly-owned subsidiary of Asia Pacific that, in turn, owns 100 percent of the rights to the City of Gold mineral exploration project in Myanmar. This project covers an area of approximately 465 square kilometers close to hydropower, water, and infrastructure. This is to accommodate exploration and development of the property. City of Gold can earn the Option upon issuance of an exploration license for the City of Gold Project, subject to a financing condition. Fortem Resources announced in August of 2017 that it indirectly acquired by way of Rolling Rock Resources, LLC, a wholly-owned subsidiary, an undivided 75 percent interest in more oil and gas leases in the Mancos formation covering 2,313.09 acres. The leases were acquired at a SITLA (State of Utah School and Institutional Trust Lands Administration) auction. With an agreement entered into with Rockies Standard Oil Company, LLC, who holds the remaining 25 percent interest, the parties agreed to enter into a joint operating agreement covering the new leases. The leases are outside the AMI (Area of Mutual Interest) of its original joint venture (JV) lease holdings. This week, Fortem Resources announced that it closed a private placement of 25,000 common shares at a price of US$2.00 per Share. Gross proceeds were US$50,000. Fortem Resources, Inc. (FTMR), closed Thursday's trading session at $2.90, even for the day. The average volume for the last 60 days is 3,564 and the stock's 52-week low/high is $0.675/$3.25. Tech Stock Insider, MarketWatch, and InvestorsHub reported on Lexington Biosciences, Inc. (LXGTF), and we report on the Company as well, here at the QualityStocks Daily Newsletter. A medical device company, Lexington Biosciences, Inc. is developing the HeartSentry. This is a new non-invasive diagnostic device to measure and monitor cardiovascular health through assessing the function of a person's vascular endothelium. This is the essential innermost lining of a person's cardiovascular system. The Company’s objective is to become a leader in the development of clinical grade cardiovascular self-measurement solutions for home and clinical use. Lexington Biosciences is engaged with the US FDA (Food and Drug Administration) and other regulatory agencies on the required product approvals for the HeartSentry. Lexington Biosciences has offices in Vancouver, British Columbia; and Reno, Nevada. HeartSentry targets the fast growing self-measurement medical device sector. The design of the HeartSentry unit is to use Bluetooth and Cloud technology to provide up-to-date and accurate readings of an individual’s complete cardiovascular health via electronic monitoring for risk-assessment and treatment effectiveness targeting the prevention of heart attack and stroke. HeartSentry is the Company’s flagship, and first device currently advancing to commercial deployment. Lexington Biosciences earlier announced delivery of its first order of HeartSentry devices scheduled for clinical trials. The HeartSentry core technology underwent development at the University of California Berkeley over a fifteen-year research and development (R&D) period involving manifold research studies and product iterations resulting in a portfolio of numerous pending and issued patents licensed to Lexington Biosciences. The Company’s goal is to make HeartSentry accurate, fast, and cost effective so it can become the standard of care for cardiologists, general practitioners, and ultimately patients for first line evaluation of a person's cardiovascular health. Lexington Biosciences announced in late 2017 the engagement of San Francisco Bay Area-based Diablo Clinical Research to conduct its HeartSentry pilot clinical studies. Last month, Lexington Biosciences announced the start of its clinical trial and first patient enrolment. The design of the clinical studies is to measure the safety and effectiveness of the HeartSentry technology for cardiovascular health diagnosis. Earlier this month, Lexington Biosciences provided an early update of its clinical trial and patient enrolment. The team at Diablo Clinical Research, site of the investigative study, advised Lexington that five patients have now been successfully enrolled and admitted to the program. They have undergone the first series of tests with HeartSentry. Under the leadership of Dr. Geoff Tison, M.D. M.P.H., initial results indicate the device is functioning as designed with quantifiable results. Lexington Biosciences, Inc. (LXGTF), closed Thursday's trading session at $0.3569, up 1.12%, on 172,588 volume with 100 trades. The average volume for the last 60 days is 357,297 and the stock's 52-week low/high is $0.2506/$0.4844. Investing, InvestorsHub, and MarketWatch reported on Rego Payment Architectures, Inc. (RPMT), and we report on the Company as well, here at the QualityStocks Daily Newsletter. Rego Payment Architectures, Inc. formerly operated under the name Virtual Piggy, Inc. On March 16, 2017, the Company, creators of the only COPPA compliant technology targeted at providing payment capability for the under 18 market, announced its name change to reflect the progression of the Company into broader payment-related markets. Rego Payment Architectures lists on the OTC Markets Group’s OTCQB. REGO Payment Architectures, Inc. became an umbrella under which the Intellectual Property (IP) developed becomes available to many different industries beyond the under 18 market. Rego Payment Architectures is headquartered in Palm Beach, Florida. The Company’s core technology base is established on validated artificial intelligence (AI) techniques. It has extensive capability to adapt to a wide assortment of payment markets and users. The core technology comprises ReTRO (Real Time Regulatory Oversight), established on advanced AI techniques, a system of reasoning engines, and a Contract Model (CM), which permits the creation of specific boundary conditions for its use. Rego also has its NOMad (Networks of Meaning ad-vantage). This is an advanced data mining application that monitors people and the things they interact with. Furthermore, the Company has its RSM (REGO Payment Architectures, Secure Financial Messaging) - the payment control system. REGO Payment Architectures signed a definitive agreement with Be Informed BV, effective July 2017, for the Company’s commercial launch of its unique digital mobile payment system. The terms and conditions allow Rego's COPPA compliant OINK payment platform unlimited use of its developed technology to be available to children and their families for direct mobile payments. In addition, Rego Payment Architectures and Be Informed entered into three new MOU’s in expectation of the many and diverse expanding markets where this mobile payment technology will be advantageous. The MOU's allow Rego to enter into production agreements under like terms and conditions to its OINK payment platform. The agreements cover the expected welfare benefits, the unbanked and closed loop platforms. REGO Payment Architectures has its Beta version of the OINK Payment System for Children. OINK (Online Instant Networking Keypad) is a technology that speeds up payments and makes making payments simple and streamlined. Fundamentally, Rego Payment Architectures is redirecting its efforts to instant Peer to Peer (P2P) transfers employing mobile phones and online systems. The Company’s new business model is an instant revenue producing membership system. It provides Rego Payment Architectures with greater flexibility in fund management. It also provides extra layers of security to protect members’ privacy and their transactions. Rego Payment Architectures, Inc. (RPMT), closed Thursday's trading session at $0.23, up 12.91%, on 31,900 volume with 61 trades. The average volume for the last 60 days is 20,729 and the stock's 52-week low/high is $0.10/$0.44. Real Pennies and Gold Investment Letter reported previously on Bravada Gold Corp. (BGAVF), and we report on the Company today, here at the QualityStocks Daily Newsletter. Bravada Gold Corp. is a Nevada-focused exploration and development company. The Company has a large portfolio of high-quality properties. These properties cover a range of development stages - from early-stage exploration to advanced-stage exploration and pre-development. Listed on the OTC Markets Group’s OTCQB, Bravada Gold has its head office in Vancouver, British Columbia. Bravada Gold explores for precious metals in well-established gold trends in one of the world's best gold jurisdictions. Currently, five of its Nevada properties are being funded by partners. In total this includes earn-in work expenditures of up to $6.5 million and payments to Bravada Gold of up to +$3.0 million in cash and shares. Bravada Gold retains residual working or royalty interests. For 2017, the Company says that mine permitting continues on its Shoshone Pediment project. Bravada holds a royalty on eventual barite production. Pertaining to its Wind Mountain project, Bravada Gold’s plan is to drill-test for high-grade “Hishikari-type” gold/silver vein mineralization beneath the existing disseminated resource at Wind Mountain. Regarding the SF property, the Company plans to drill-test for high-grade “Carlin-type” gold mineralization at the SF property. Concerning the North Lone Mountain and South Lone Mountain projects, plans have not been finalized for Bravada’s two claim groups. However, Nevada Zinc continues to expand the footprint of zinc mineralization on its claims towards Bravada’s South Lone Mountain claims. Should Nevada Zinc complete the purchase of these claims, Bravada Gold will retain a royalty on base and precious metals. In May of this year, Bravada Gold announced that it received notice that a third-phase drilling program is underway at its Baxter Low-sulfidation gold property in the Walker Lane Gold trend in Nevada. Kinross Gold U.S.A., Inc. plans to drill 8 to 12 reverse-circulation (R.C.) holes for roughly 2,600 meters. Kinross Gold U.S.A. is a wholly-owned subsidiary of Kinross Gold Corp. The Baxter property comprises 240 unpatented lode claims (approximately 1,940 hectares) in the Walker Lane Gold trend of western Nevada. Bravada Gold previously demonstrated widespread low-sulfidation gold and silver mineralization at surface and in relatively shallow reverse-circulation drill holes at a number of target areas. Bravada Gold Corp. (BGAVF), closed Thursday's trading session at $0.077, up 2.80%, on 63,009 volume with 6 trades. The average volume for the last 60 days is 17,768 and the stock's 52-week low/high is $0.071/$0.2567. The QualityStocks Daily Newsletter would like to spotlight Medical Innovation Holdings, Inc. (MIHI). Today, Medical Innovation Holdings, Inc. closed trading at $0.119, up 13.33%, on 24,750 volume with 7 trades. The stock’s average daily volume over the past 60 days is 97,274, and its 52-week low/high is $0.105/$3.04. Medical Innovation Holdings, Inc. (OTC: MIHI) today announces that it has reached an agreement with two of the Company's largest shareholders to retire a total of 10 million common shares. As of the last filing on March 19, 2018 the issued and outstanding shares count was 40,912,082 common shares. Medical Innovation Holdings, Inc. (MIHI), a Colorado-based publicly traded company, owns and operates strategically aligned healthcare service and product companies focused on the delivery of patient care, management services for physician offices, lab services, and pharma; and non-pharma medicines and alternatives to patients and consumers. Healthcare services are delivered and managed through the company's MSO, 3Point Care. 3Point Care uses virtual telemedicine with a unique customized software and hardware platform as a way of bringing quality medical care to rural and medically underserved areas (MUAs) of the country. 3Point Care provides personalized high-tech, high-touch telemedicine encounters that link virtual health specialty doctors with traditional primary physicians and their patients. This approach helps reduce the cost of care while enhancing the quality of care. The company's telemedicine approach is vastly different from other providers who rely on a monthly subscription to opt in the network and then require an encounter fee by the patient each and every time an on-demand physician is utilized. This approach breaks the continuum of care, relies on symptom-based diagnosis, does not accept insurance, and there is no certainty you are dealing with a licensed practitioner. In summation they are not a medical practice but a contract service to deliver virtual care. Because 3Point Care deploys doctors through an actual medical practice, there is no subscription fee. The company works with anyone and everyone that has insurance including Medicare and Medicaid. It works hand and hand with the patient's primary care physician so the continuum of care is always maintained. Part of the integrated software application enables the processing of insurance claims whereby doctors are paid for their services. This allows deductibles to be captured, allowing the patients to take advantage of medical tax deductions. TeleLifeMd, a multi-disciplinary specialty healthcare practice with strong experience in telemedicine, is the primary deliverer of patient medical care. 3Point care has a unique and exclusive relationship with TeleLifeMD, acting as its management services organization by providing all levels of service that include scheduling, providing telemedicine hardware and software products and support, processing claims, paying all invoices and payroll incurred by TeleLifeMD, as well as any other service required to operate the practice. BKare Diagnostics, another wholly owned subsidiary of MIHI, is tasked with delivering medical and health-related services such as laboratory testing, diagnostics, and alternative medicines primarily proven nutraceuticals. Its goal is to eventually infuse these products with 100% CBD/Hemp oil and THC-based oils to create new product categories as the law catches up with the cannabis marketplace. The opportunity to offer workable solutions that solve real health problems outside typical big pharma is very exciting for the company. It sees significant revenue opportunities in this space. MIHI firmly believes the best way to provide access to high-quality medical care is through support and delivery of evidence-based virtual medicine, commonly known as telemedicine. With 80 million people living in rural, medically underserved areas of the nation, the company is poised to fill a glaring void in the healthcare industry by applying cutting-edge technology and time-tested business practices to deliver real-time care. Among the 16 areas of medical specialties available are cardiology, infertility, gastroenterology, pediatrics and obstetrics. The QualityStocks Daily Newsletter would like to spotlight Choom Holdings Inc. (CHOOF). Today, Choom Holdings Inc. closed trading at $0.75, up 7.71%, on 252,297 volume with 219 trades. The stock’s average daily volume over the past 60 days is 97,299, and its 52-week low/high is $0.125/$0.8612. NetworkNewsWire ("NNW"), a multifaceted financial news and publishing company, today announces the publication of an editorial featuring Choom Holdings Inc. (CSE:CHOO) (OTCQB:CHOOF), a client of NNW focused on channeling the spirit of Hawaii in the Okanagan and building culture around its high-grade handcrafted cannabis brand. To view the full publication, titled “Cannabis Companies Prepare their Brands for Canadian Legalization,” visit: http://nnw.fm/oDL6d. Choom Holdings Inc. (CSE: CHOO) (OTCQB: CHOOF) channels the laid-back spirit of Hawaii to the Okanagan region of British Columbia with a generous nod to the inspirational, yet unofficial, history of the 1970s "Choom Gang," a group of buddies in Honolulu (including former President Barack Obama) who knew how to relax with "choom," the local's term for marijuana. Choom's trademark slogans pivot off another unconventional phrase ("Say Hello to…"), bringing a heady dose of good times and good friends together as the company invites investors to "Say Hello to Choom™" as it lights up the adult recreational cannabis market in Canada. Choom™ has been an ACMPR (Access to Cannabis for Medical Purposes Regulations) applicant since November 2013 in Vernon, B.C. The company's first application has received security clearance and is now in the detailed review stage. They also recently announced their second late-stage ACMPR application, which is in its confirmation of readiness stage. Cannabis Compliance Inc. has been retained to help expedite Choom's initial license applications to ensure the company's readiness for legalization of recreational marijuana in Canada mid-summer 2018. True to the company's character, Choom™ is retrofitting two large facilities – No. 1 in Vernon, B.C., and No. 2 on Vancouver Island – to house its cannabis growing facilities. Phase 1 of the Vernon property will provide Choom™ with 6,800 square feet of growing space, capable of producing 660 kg/year of cannabis at an estimated revenue of $6.6 million, excluding oils. The company expects this facility to be completed by July 2018, the same month that Canada is expected to formally legalize recreational marijuana for adult use. A potential Phase 2, to be completed by the end of 2018, would add another 6,800 square feet for a total of 1,500 kg/year capacity, which would nearly double No. 1's revenue. A Level 9 vault is also planned with a storage capacity of 15,000 kg. While the No. 2 facility on Vancouver Island is smaller – 4,500 square feet – its retrofit is also slated to be completed by July 2018. Plans include doubling this space as well, which would add about $9 million in annual revenue, excluding cannabis oils. Choom™ announced its retail dispensary strategy with the intention of establishing market leadership in reaching the Canadian cannabis consumer. The partner program is already in the retail space design stage as the company seeks to build a chain of branded retail cannabis dispensaries in jurisdictions in Canada where recreational cannabis is legal. Choom™ Stores will have a cool, modern layout and design created to emit an authentic "Aloha" vibe. Choom™ is all about producing high-grade cultivars and curating them for a bigger audience. NetworkNewsBreaks – Choom Holdings Inc. (CSE: CHOO) (OTCQB: CHOOF) Enters LOI to Acquire Flower Power Cannabis Pharms Inc. The QualityStocks Daily Newsletter would like to spotlight MGX Minerals Inc. (MGXMF). Today, MGX Minerals Inc. closed trading at $0.765, up 4.38%, on 378,161 volume with 122 trades. The stock’s average daily volume over the past 60 days is 322,403 and its 52-week low/high is $0.543/$1.5835. MGX Minerals Inc. (CSE: XMG; FKT: 1MG; OTCQB: MGXMF) is pleased to report additional assay results of Petroleum Coke samples collected from stockpiles produced from the Fort McMurray area mining and upgrading operation as well as the Edmonton refinery. MGX Minerals Inc. (CSE: XMG) (FKT: 1MG) (OTCQB: MGXMF) is a diversified Canadian resource company developing large-scale mineral portfolios in specific commodities and jurisdictions in North America. The company controls significant interest in lithium, magnesium and silicon assets that offer streamlined development timelines and low capital expenditures. MGX Minerals and its engineering partner have developed a patent-pending, low-energy design process to extract valuable minerals from the abundant, highly mineralized brine wastewater produced each year by oil and gas companies. This proprietary, petrolithium process rapidly concentrates lithium and other minerals from brine in less than a day. That's a stunning advancement from the conventional method of extracting minerals from brine through an evaporation process that can take up to 18 months, requires hundreds of acres of land, and averages less than a 50 percent mineral recovery rate. Using this advanced water purification technology, MGX Minerals cleans the wastewater that accompanies petroleum as it's being pulled up to the surface. The company's petrolithium process eliminates the need to inject contaminated wastewater back into the ground, which prevents drinking water contamination and possible earthquakes. In January 2017, MGX Minerals successfully recovered concentrated lithium from heavy oil evaporator blowdown wastewater using its rapid recovery process, an accomplishment independently confirmed by the Saskatchewan Research Council. In August 2017, the company also successfully processed wastewater and lithium brine from eight North American projects at its one-cubic-meter-per-hour processing plant, proving the technology is economically viable. Research group Global Water Intelligence expects the wastewater treatment industry to grow into a $45 billion market annually by 2025, which suggests there are ample revenue-generating opportunities for MGX Minerals technology. Lithium, the "white gold" of the new energy economy, is the key to clean energy development as global demand for hybrid and electric vehicles, high-drain portable electronic devices, and large-scale energy storage systems ramps up. Grand View Research, Inc. reports that the global lithium-ion battery market is expected to reach $93.1 billion by 2025. Current market forces show a high demand for lithium and a low supply, which further supports the necessity of MGX Mineral's cleaner, faster method of extracting high-value minerals from brine wastewater. The QualityStocks Daily Newsletter would like to spotlight Global Payout, Inc. (GOHE). Today, Global Payout, Inc. closed trading at $0.01365, off by 0.36%, on 9,989,478 volume with 211 trades. The stock’s average daily volume over the past 60 days is 11,322,522, and its 52-week low/high is $0.0123/$0.16. Payment solutions company Global Payout, Inc. (OTC: GOHE) this morning announced that on April 4th, 2018, its MoneyTrac Technology, Inc. subsidiary will be launching MTRAC, a full-service banking solution powered by GreenBox blockchain technology. To view the full press release, visit: http://cnw.fm/T8hkZ. Also today, NetworkNewsWire released a report on the company detailing how GOHE is to extend its innovative financial technology solutions to business logistics sectors in need of clear processes that let daylight in on their operations. Today, more than ever before, commercial enterprises and government institutions need powerful financial technology solutions that have the flexibility to deliver innovative customer centric services and drive operational efficiency gains throughout the organization. The Global Reserve Platform is Global Payout's fully configurable "banking-in-a-box" web-based platform that can fulfill the front-to-back office processing requirements of domestic, foreign exchange and international payment service providers. This platform is designed to improve work flow, operational efficiencies, and global financial management for enterprises operating across the globe. Investment in financial technology (FINTECH) companies has grown dramatically in recent years with the role of today's banks shrinking and demand for improved financial solutions continuing to rise. As the industry has continued to expand rapidly, Global Payout's management team has directed its focus on identifying the most promising market sectors with FINTECH needs. The four core areas selected are logistics, small and medium enterprises (SME), banking and travel. In 2015, Global Payout introduced MoneyTrac Technology Inc. as a majority owned subsidiary to more effectively focus on the development of financial technologies that specifically address many of the challenges that enterprises in a variety of alternative and "high-risk" market sectors are faced with in processing financial transactions. Powered by Virtu Network Solutions, the MoneyTrac Technology platform is one the most configurable and intuitive financial technology platforms available to alternative and "high-risk" enterprises and provides them with solutions that effectively manages everything from pin debit and virtual currency, to compliance and cash flow logistics. The QualityStocks Daily Newsletter would like to spotlight AnalytixInsight Inc. (ATIXF). Today, AnalytixInsight Inc. closed trading at $0.307, even for the day. The stock’s average daily volume over the past 60 days is 13,691 and its 52-week low/high is $0.15/$0.6898. AnalytixInsight (TSX.V: ALY) (OTCQB: ATIXF) is pursuing the widespread growth and opportunity in the artificial intelligence space. To view the full article, visit: http://nnw.fm/Y0Gda. The company's flagship product – CapitalCube.com – is a financial portal providing comprehensive company analysis including on-demand fundamental research, portfolio evaluation and screening tools on over 50,000 global equities and North American ETFs. CapitalCube's online portal is designed to empower investment ideas by providing in-depth analysis, peer-to-peer performance evaluations, accounting and earnings reports, dividend strength and AI-supported information about likely corporate actions such as dividend changes, share buybacks and acquisitions. AnalytixInsight provides a robust technology that is frequently rebalanced to maintain a desired risk profile, matching risk to ideal ETF exposure, with regular compliance reporting. CapitalCube's freemium pricing model allows free access to basic financial information, with additional in-depth analysis and predictive analytics provided at a rate of $25 per month, and customized peer analysis for $300 per month. CapitalCube publishes 3,000 articles daily and has multi-language capabilities. Thomson Reuters and Africa Investor have recently been added to the growing network of content partnerships that already includes Euronext NV, Yahoo Finance and The Wall Street Journal. MarketWall is a Fintech subsidiary that develops integrated software solutions as part of an ecosystem of smart devices that includes PCs, tablets, smart phones, wearable mobile devices and Smart TV. AnalytixInsight Inc. has joint ownership in MarketWall together with Intesa Sanpaolo, Italy's largest retail bank which has over 4,000 branches and a market capitalization of $40 billion Euros. MarketWall is expected to deploy its real-time stock trading and mobile banking app to Intesa Sanpaolo's 12.6 million customers in six European countries during 2018. The mobile stock trading application will directly interface with Intesa Sanpaolo's established MarketHub trading platform. As a Samsung Global Partner, the MarketWall app is preloaded in mobile devices in certain areas in Europe. The QualityStocks Daily Newsletter would like to spotlight Medical Cannabis Payment Solutions (REFG). Today, Medical Cannabis Payment Solutions closed trading at $0.0313, off by 2.19%, on 256,400 volume on 27 trades. The stock’s average daily volume over the past 60 days is 502,747, and its 52-week low/high is $0.0161/$0.12. Cannabis-focused financial services company Medical Cannabis Payment Solutions (OTC: REFG) has developed the Green platform, a top tier digital payment processing system that offers ease of cash management to merchants while enabling consumers and patients to purchase electronically, even with cryptocurrency. To view the full article, visit: http://cnw.fm/ua2WE. Also today, NetworkNewsWire released a report on the company detailing how REFG offers a proprietary, completely integrated payment solution for customers and licensed medical cannabis establishments in its Green platform. The QualityStocks Daily Newsletter would like to spotlight Marijuana Company of America Inc. (MCOA). 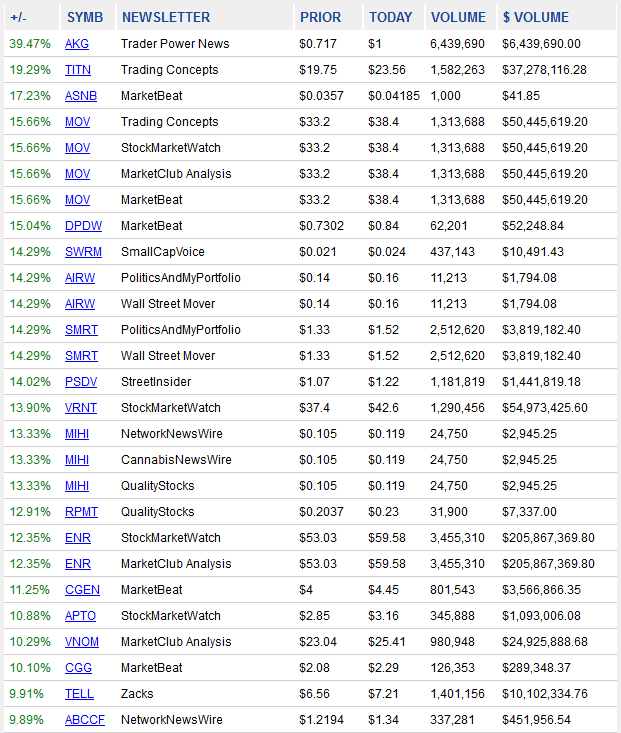 Today, Marijuana Company of America Inc. closed trading at $0.0265, up 3.11%, on 1,879,177 volume with 154 trades. The stock’s average daily volume over the past 60 days is 9,885,520 and its 52-week low/high is $0.0181/$0.0728. Marijuana Company of America, Inc. (OTC: MCOA) is a company that provides a wide assortment of products and services in the hemp industry. It is establishing itself as a leader in the hemp space by creating a diversified umbrella of investments involved in cultivation, processing, manufacturing and distribution. Marijuana Company of America Inc. (MCOA) (the "Company") are pioneers in the cannabis industry going back to 2009 when Don Steinberg, MCOA's CEO, founded the first marijuana company ever to trade on a US stock market, Medical Marijuana Inc. Since then, Don and his partner, Charlie Larsen, have formed Global Hemp Group and Marijuana Company of America. They have experienced the shift of legislation first hand, not only for the legalization of marijuana but also the emerging hemp-based CBD products. The CBD market is growing expotentially and consequently the founders of MCOA have contructed their business model around the development of industrial hemp-based CBD products. The industrial hemp plant can also be used to produce products that are carbon neutral or even carbon negative, like the longest, strongest natural fiber on earth, building materials that are mold, pest and fire proof, super foods and so much more for additional business opportunities. No part of the plant is left unused and the Company's overall stategy is to take advantage of every profit center from farm to the multiple valuable finished products. The cannabis and hemp industries are experiencing unprecedented exponential growth that is expected to continue for many years as these industries are now accepted globally and continue to mature and expand. North American consumers spent $6.7 billion on legal cannabis products in 2016, up 34% from 2015's $5 billion. This trend is widely expected to explode at a 27% compounded annual growth rate to reach $22.6 billion by 2021, according to ArcView Market Research. The company offers investors the opportunity to be on the forefront of cannabis and hemp innovation through cultivation, processing in the legal and cannabis and industrial hemp sectors. The Company's business model includes producing a diverse portfolio of synergistic business segments that provide value to its shareholders. Its vertically integrated business model and distribution platforms are positioned to capture market share by developing recognizable and valuable brands. The QualityStocks Daily Newsletter would like to spotlight Singlepoint, Inc. (SING). Today, Singlepoint, Inc. closed trading at $0.034, off by 2.58%, on 6,271,643 volume with 400 trades. The stock’s average daily volume over the past 60 days is 8,232,706, and its 52-week low/high is $0.0132/$0.415. SinglePoint (OTCQB:SING) announces LastMile Delivery, a platform giving small businesses and cannabis delivery companies a solution to efficiently manage deliveries. Singlepoint, Inc. (SING) has grown from a full-service mobile technology provider to a publicly-traded holding company. Through diversification into horizontal markets, SinglePoint is building its portfolio by acquiring an interest in undervalued subsidiaries, thereby providing a rich, diversified holding base. SinglePoint's approach is to first research and identify acquisition opportunities in which it can take an active and influential role among existing leadership to provide enhanced strategy and direction. Target companies are undervalued, cash-flow positive, with high potential and verified assets. SinglePoint acquires and takes controlling interest of successful candidate companies. SinglePoint recently signed a Letter of Intent to acquire an interest in Jacksam Corp., dba Convectium, a profitable California-based provider of equipment, branding, and packaging solutions for the cannabis industry. Convectium has developed the world's first cartridge and vape pen oil filling machine for wholesale distribution to dispensaries. The 710Shark and 710Seal systems can fill and package over 100 cartridges or disposable vape pens in 30 seconds and are sold to dispensaries through its EquipCanna.com brand. The company also operates a consumer brand that includes BlackoutX and HazeSticks and reaches customers in over 52 countries. Additionally, SinglePoint has raised more than $300,000 and has signed a Letter of Intent to secure an additional $1 million in funding. The move provides management with ample capital to execute its business plan, while avoiding debt repayments that can eat into cash flow and reduce flexibility over time. It's also a rare development for a development-stage company in the cannabis industry. Guided by a visionary leadership team with extensive experience in technology, engineering, marketing and raising capital, SinglePoint continues to explore high-potential acquisition opportunities to grow and diversify its current holding base. The company also plans to uplist to the OTCQB and become a fully reporting company during the current fiscal year. The QualityStocks Daily Newsletter would like to spotlight PreveCeutical Medical Inc. (PRVCF). Today, PreveCeutical Medical Inc. closed trading at $0.2931, off by 2.30%, on 19,914 volume with 15 trades. The stock’s average daily volume over the past 60 days is 23,179, and its 52-week low/high is $0.01/$0.80. PreveCeutical Medical Inc. (CSE:PREV) (OTCQB:PRVCF) (FSE:18H), announces the arrival of the first shipment of dried cannabis flower and oils from Aurora Cannabis Inc. (TSX:ACB) (OTCQB:ACBFF) at the Pharmacy Australia Centre of Excellence (“PACE”), University of Queensland (“UQ”). Also today, CannabisNewsWire released a report on the company detailing how PRVCF is developing new cannabis-based medicines and delivery systems through partnership with researchers in Australia. PreveCeutical Medical Inc. (PRVCF), headquartered in Vancouver, British Columbia, Canada, is a health sciences company dedicated to researching and developing innovative options for preventive and curative therapies utilizing organic and Nature Identical™ products. The company is strategically staking out select positions in the medically acute areas of diabetes and obesity, pain management, neurological disorders and cancer. PreveCeutical Medical Inc. had its beginnings in 2009 when Stephen Van Deventer, a seasoned businessman and venture capitalist, and Kimberly Van Deventer, a successful entrepreneur, met and formed a business partnership. The duo created Cornerstone Global Partners, a venture capital and business development company, and became involved in numerous ventures including building companies such as Aurora Cannabis Inc. Taking their interest in the health and wellness market further, the pair began researching how nature and science can work together to benefit health-conscious consumers. Coining and trademarking the word "PreveCeutical" – a combination of the words "preventive" and "pharmaceutical" – was a precursor to the company's formation and incorporation in October 2015. The company's first product was developed in the Dominican Republic and is now marketed and distributed worldwide by PreveCeutical. It is a Caribbean Blue Scorpion venom product sold under the trade name CELLB9®. This product is an oral dilute solution infused with select peptides sourced exclusively from the blue scorpion (Rhopalurus princeps) found only in Caribbean nations. The active potentiated ingredients in CELLB9, which have been used in over 40 countries for over a decade, appear to support health at a deep, cellular level. PreveCeutical's research team is using proprietary chemistry to generate Nature Identical™ peptides derived from natural compounds found in Caribbean Blue Scorpion venom with the goal of eventually treating, regulating and preventing cancer progression. Peptides are also being used to target an array of disease indications including metabolic disorders, pain management, cancers, cardiovascular and infectious diseases. PreveCeutical is working with four leading Australian research centers to develop a curative therapy for diabetes and obesity. This four-year program involves engineering a novel approach that selectively targets the gene that encodes for the protein PTP-1B, which is implicated and over-expressed in both type-2 diabetes and obesity. PreveCeutical's gene-silencing technology would effectively "turn off" the genetic signal which leads to the over-production of this key protein molecule, bringing it back down to safe, normalized levels, and prevent the body from storing excessive fat. Diabetes kills one person every six seconds, with more than $800 billion spent globally on the disease. PreveCeutical Medical's science and research team is led by Dr. Harendra (Harry) Parekh, Ph.D., who is based at the University of Queensland's (UQ) Pharmacy Australia Centre of Excellence (PACE), and Dr. Makarand Jawadekar, Ph.D., whose 28 years of R&D experience with Pfizer Inc., is applicable in his role as chief science officer. Research collaborators include Dr. Rakesh Veedu, an emerging expert internationally in the field of molecular medicine, and Professor Grant Ramm, who is currently head of a leading medical research institute located in Brisbane, Australia. 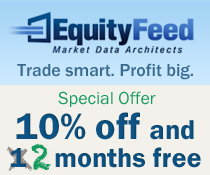 The QualityStocks Daily Newsletter would like to spotlight Petroteq Energy Inc. (PQEFF). Today, Petroteq Energy Inc. closed trading at $1.0377, off by 8.97%, on 199,895 volume with 275 trades. The stock’s average daily volume over the past 60 days is 133,553, and its 52-week low/high is $0.015/$1.8892. Petroteq Energy Inc. (TSXV: PQE) (OTC: PQEFF) (FSE: A2DYWC), a company focused on the development and implementation of proprietary technologies for the energy industry, announced today that it will be presenting at the MicroCap Conference, being held on April 9-10 at the Essex House, New York City. Petroteq Energy Inc. (TSX.V: PQE) (OTCQB: PQEFF), with headquarters in Canada, seeks to create the world's largest pure-play cobalt exploration and development company. The company's current focus is on its Greater Cobalt Project located in Silver Centre, Ontario. The company is also in the midst of a three-way merger with Cobalt One Ltd. and CobalTech Mining Inc. and on completion First Cobalt will control over 10,000 hectares of prospective land and 50 historic mining operations in the Cobalt Camp in Ontario, Canada, as well as a mill and a permitted refinery facility. The merger agreements with Cobalt One Ltd. and CobalTech Mining Inc., announced earlier this year, will result in a combined land position of more than 10,000 hectares (nearly 25,000 acres) in the Cobalt Camp containing approximately 50 past cobalt/silver producers and working mines. Initial test results from a mineralogical assessment of sample material taken from various historical mines located throughout the Cobalt Camp show both cobalt-rich and silver-rich mineralization styles. Samples taken at the former Bellellen mine, located within the Greater Cobalt Project in Ontario, show high grade cobalt assays, prompting First Cobalt to increase its drilling program at that site. Petroteq Energy Inc. is moving quickly to leverage its potential against an economic background that estimates global consumption for refined cobalt is set to grow at an average rate of approximately 5 percent per annum for the next 10 years. The electric vehicle market, in particular, is driving this sector since more than 50 percent of the world's current production of cobalt is used in the manufacture of rechargeable lithium-ion batteries. The global lithium-ion battery market, as estimated by Zion Market Research, indicates the value at around USD $31 billion in 2016 and is expected to generate revenue of nearly USD $68 billion by end of 2022, growing at a compound annual growth rate of slightly above 17 percent. The company's clear pathway to production and cash flow generation includes being one of only four fully permitted cobalt extraction refineries in Canada with significant material and processing infrastructure on site. With the price of cobalt increasing significantly and its importance in the growing battery market underpinning a strong long-term demand forecast, Petroteq Energy Inc. and its mining interests are primed for success. Click here to begin your review. Consorteum Holdings Inc.’s (CSRH) Executes Exclusive Distribution Contract with DevLex Ltd.
each trading day. QualityStocks is committed to bring our subscribers Public companies in our Newsletter Section "Free of Charge"
based on Percentage gained, Momentum, Press, and or Company Fundamentals.